In Eisenhüttenstadt there is the „Zentrale Aufnahmestelle für Asylbewerber“, the central refugee camp, in Brandenburg. That means that every refugee that is seeking asylum in Brandenburg is sent to the lager in Eisenhüttenstadt, where they have to live during their asylum process until they get transfered to another lager in Brandenburg or deported. Part of the lager is a deportation prison where rejected asylum seekers are brought to to deport them directly. Governed by a security company named B.O.S.S., the situation is increasingly bad: the rooms are crowded, the toilet and shower rooms are poor and dirty. The refugees are kept away from necessary information. There is security staff everywhere. Refugees are isolated in the camp, for the majority of them it’s not allowed to travel to Frankfurt or Berlin for a lawyer or councelling center without applying for a special permission, because of the „Residenzpflicht“. The refugees cannot select what they want to eat because every day they get the same bad food in a canteen in the lager. People are deported right from their rooms, in front of the others, deportations can happen everytime. That caused an atmosphere of fear in the whole camp. Wir haben jetzt als Ersatzprogramm den Film „The Truth Lies in Rostock“ auf Deutsch und Englisch. As an alternative programm we will show the movie „The Truth Lies in Rostock“ in German and English. Malheureusement à cause des circonstances à court terme, Allmende peut pas nous joindre pour notre Vokü. Nous sommes en train d‘organiser un programme alternatif, qui va aussi concerner à peu près notre sujet original. Leider kann wegen kurzfristiger Umstände Allmende keine Vortrag bei unserer Vokü halten. Wir sind gerade dabei ein Alternativprogramm zu organisieren, welches ungefähr unsere ursprüngliche Thematik behandelt. Unfortunately because of short term circumstances, Allmende cannot join us at our Vokü. We are organising an alternative programme right now, which will also deal with our original topic. Am Dienstag den 28.5. ab 20 Uhr gibt es in der Friedel 54 wieder leckeres Essen, diesmal mit Informationen zu 20 JahreAbschaffung des Grundrechts auf Asyl und dem Mordanschlag von Solingen mit Allmende. Mardi le 28.5. à partir de 20h il y a bien repas, cette fois-ci avec des informations concernant le 20 anniversaire de l‘abrogation de l‘asile comme droit fondamentale et le massacre de Solingen avec Allmende. 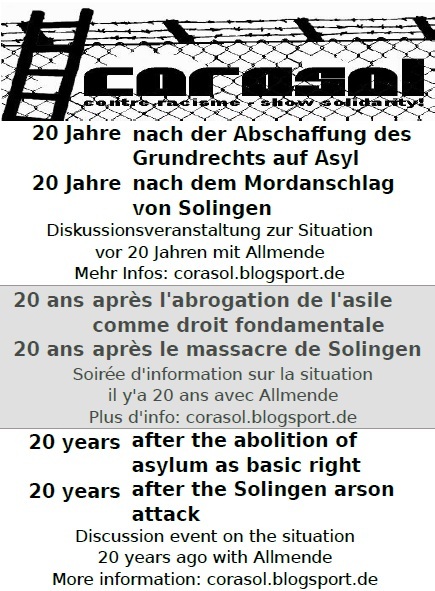 Tuesday the 28th 8pm there’s again good food, this time with information 20 years the abolition of asylum as basic right and the Solingen arson attack with Allmende. Du browst gerade in den Corasol Weblog-Archiven nach dem Monat Mai 2013.